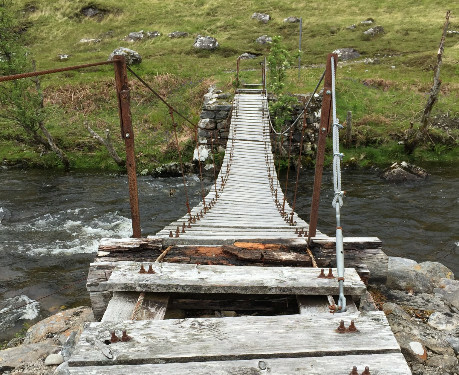 Mountaineering Scotland is to make a donation of �5000 towards an important footbridge in Knoydart. The Carnoch Bridge, over the River Carnach at NM866965, was removed earlier this year after flood damage made it too dangerous to use. The bridge was on the Camusrory Estate and, though not crucial to estate operations, was a vital link in the popular walkers� route from Inverie to Sourlies Bothy (NM869951). The route is also the main walking route into Knoydart from the south and part of the Cape Wrath Trail, and it has been estimated 2-3000 people were using it each year. The remote location means that bringing in the materials and constructing a safe replacement will be a costly exercise, which has been estimated at a total of �45-50,000. This comprises �32,000 for the bridge itself � a two-span girder bridge, with a higher clearance than the old one � and substantial costs for transportation and installation. Scotways, formerly the Scottish Rights of Way Society, is coordinating an appeal to raise funds for the bridge replacement and has pledged �5000 of its own funds. Mountaineering Scotland has agreed to donate �5000, as has the Mountain Bothies Association, with �10,000 pledged by the Scottish Mountaineering Trust. If any individual member would like more information or would wish to support this project, they can contact Scotways Director David Dixon on 01875 812985.